(2012.201.b1270.0167, Oklahoma Publishing Company Photography Collection, OHS). The Oklahoma Flying Farmers organization was established in 1944 as an association for farmers who owned and operated aircraft as part of their farming operations. H. A. "Herb" Graham conceived the idea for the group after hearing about Henry G. "Heinie" Bomhoff, a farmer and acclaimed "King of the Coyote Hunters," who stalked and killed the prairie predators from his airplane. Thinking that Bomhoff would be the ideal subject for a magazine feature story, Graham traveled to Calumet, Oklahoma, to interview the colorful man. During the ensuing interview Graham learned that many other farmers owned and flew airplanes, kept them on their farms, and used them in their farming operations. Returning to Stillwater, Graham pitched the concept of creating an association of airplane-owning farmers to Dr. Henry G. Bennett, president of Oklahoma Agricultural and Mechanical College (Oklahoma A&M, now Oklahoma State University). Bennett not only liked the idea of a state flying farmer organization, but he also envisioned the possibility of a national society headquartered in Stillwater. 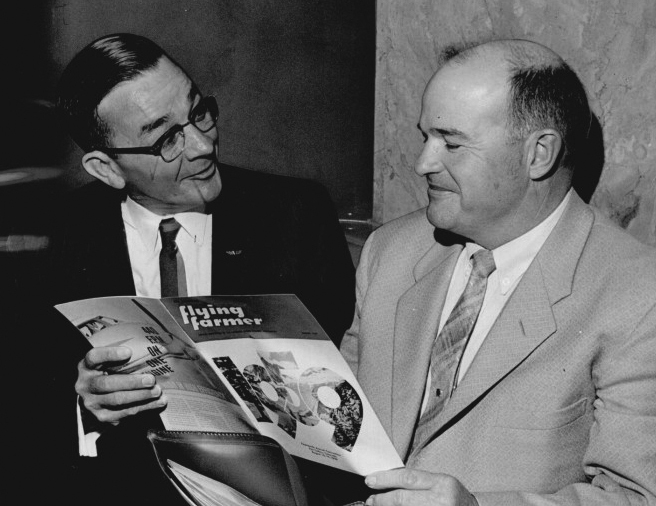 On August 3, 1944, Oklahoma A&M officials hosted an inaugural meeting there, and Oklahoma Flying Farmers was born. Oklahoma Flying Farmers would play a significant role in advancing agriculture and aviation at the state, national, and international levels. The rural aviators publicized and exhibited the utility and sometimes the necessity of employing aircraft as part of a farming operation. They demonstrated numerous uses of airplanes such as in crop spraying, crop seeding, tracking soil erosion, pest control, checking fences, feeding livestock, and locating stray animals. For the farmers, the aircraft was another time-saving implement. In August 1944 at the initial meeting of Oklahoma Flying Farmers, thirty-eight people created the world's first chapter of flying farmers. Henry Bomhoff was elected president, and Forrest Watson of Thomas, Oklahoma, was selected vice president. Thomas McCurdy of Cooperton, Oklahoma, was named treasurer, and Broneta Davis of Minco, Oklahoma, was chosen secretary. At several fly-ins to the Bomhoff farm the founders discussed and determined the membership prerequisites. To join, members must have invested a minimum of 51 percent of their working capital in a farming, ranching, or livestock operation and also had to possess some type of flying certificate. Members held the first annual convention of the Oklahoma Flying Farmers at Stillwater on August 2, 1945. Farmers and ranchers flying more than one hundred airplanes appeared from all directions and landed at the Stillwater airport. These agriculturalists attended sessions on the Oklahoma A&M campus, and during the meeting they observed manufacturer displays of aircraft such as the Piper Cub Cruiser, Aeronca, Taylorcraft, Luscombe, Silvaire, Stearman, Funk, and Swift. At this gathering Oklahoma Flying Farmers leaders decided to expand the group's organizational concept to include a national association headquartered at Oklahoma A&M, where the group would hold all national conventions. In January 1946 the National Flying Farmers Association (NFFA) was incorporated under Oklahoma law, and national organizers designated Oklahoma A&M as their headquarters location. The first conference of the new nationwide NFFA took place on August 1, 1946, in Stillwater, and Forrest Watson of the Oklahoma chapter was elected as the first president. In attendance at the first meeting was William T. Piper of Piper Aircraft Corporation. For the rest of his life Piper never missed a national gathering of the flying farmers. By 1946 there were twenty-four state chapters of flying farmers that were also members of the NFFA. In 1948 the National Flying Farmers Association convention departed its original Stillwater home, holding its annual meeting that year in Columbus, Ohio. In 1952 the national headquarters of the flying farmers moved to Wichita, Kansas, and nine years later the national society became international in scope. By 1977 the International Flying Farmers Association had more than thirty-five state chapters and similar groups in Canada, South America, and Central America. In that year, organization officials estimated total membership at approximately eleven thousand, a high point. By 2004 the number had dropped to 975 individuals. Throughout their history the flying farmers have been steadfast in cultivating a community of agriculturalists in aviation. Broneta Davis Evans and Timothy A. Zwink, The Flying Farmer Organization: First in Oklahoma (Oklahoma City, Okla.: Western Heritage Books, 1983). “International Flying Farmers,” https://www.internationalflyingfarmers.org, accessed on August 17, 2018. "National Flying Farmers Association," 1957 Convention Program, Historic Oklahoma Collection, Research Division, Oklahoma Historical Society, Oklahoma City. Timothy A. Zwink, "Oklahoma Flying Farmers," The Encyclopedia of Oklahoma History and Culture, https://www.okhistory.org/publications/enc/entry.php?entry=OK102.